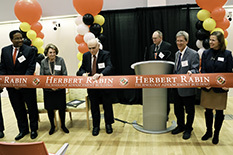 The A. James Clark School of Engineering announced the renaming of the Technology Advancement Program building to the Herbert Rabin Technology Advancement Building during a ceremony held at the University of Maryland on November 14, 2018. The building is named after Mtech’s founding Director, Herbert Rabin. Speakers at the event included: Peter Sandborn, Director of the Maryland Technology Enterprise Institute (Mtech); Laurie Locascio, Vice President for Research, University of Maryland; Darryll Pines, Dean, A. James Clark School of Engineering and Nariman Farvardin Professor of Aerospace Engineering; George Dieter, Former Dean, College of Engineering; David Barbe, former Director and Executive Director, Mtech, and Professor Emeritus, Department of Electrical and Computer Engineering; Nariman Farvardin, President, Stevens Institute of Technology; and Herbert Rabin, Founding Director, Mtech, and Professor Emeritus, Department of Electrical and Computer Engineering. Guests also celebrated Rabin’s 90th birthday. Rabin was hired by George Dieter, then Dean of the College of Engineering, in 1983, to lead the fledgling Engineering Research Center (later Mtech). Rabin came to the university after serving as Deputy Assistant Secretary of the U.S. Navy (Research, Applied and Space Technology) from 1979 to 1983, and Associate Director of Research at the Naval Research Laboratory, from 1971 to 1979. The Engineering Research Center was created to facilitate and expand productive collaboration between the University of Maryland and industry in technical and scientific areas of interest. Under Rabin’s leadership, supported by Executive Director David Barbe, the ERC served primarily as an industry-focused outreach center until 1999, when the launch of the Hinman CEOs Program and the expansion of the TAP incubator’s programming spurred an increased emphasis on entrepreneurship education and venture-building. In 2002, it became an institute at the University of Maryland and was renamed the Maryland Technology Enterprise Institute, also known as Mtech, today. Mtech’s programs now fall under three major thrusts: entrepreneurship education, venture-building, and partnerships between industry and the university. The Herbert Rabin Technology Advancement Building is home to the Mtech Ventures incubator, as well as the Startup Shell, MakerBot Innovation Center, and Terrapin Works Rapid Prototyping Center. Mtech’s incubator, formerly called the Technology Advancement Program (now Mtech Ventures), was launched in 1985. The incubator initially functioned in temporary buildings where Clark Hall now stands. In 1996, the new Technology Advancement Program building was opened at 387 Technology Drive, providing more than 33,000 square feet of incubator space for high-potential, early stage technology companies. Funding for the building was provided by the Maryland Department of Commerce. More than 137 graduate and current companies have occupied the incubator, including notable graduates such as Martek Biosciences, Digene Corporation, and Paice LLC. The Herbert Rabin Technology Advancement Building now serves 50+ technology-based companies at any point in time (including Startup Shell ventures). Its companies have generated $3.6 billion total in impact, through revenue generated, investments gained, and contracts and acquisitions. More importantly, Mtech Ventures serves the university community. Incubator companies have hired many university students since 1985 for high-tech jobs developing real products. In addition, Mtech Ventures prioritizes assisting faculty and students launching companies from UMD-originating intellectual property. Rabin’s vision, determination and leadership took what started out as a center to foster industry-university collaboration and evolved it into a regional innovation ecosystem that teaches entrepreneurship, helps students and faculty build companies, and connects Maryland companies with university resources to help them succeed. Rabin’s impact will be felt on campus and in the State of Maryland for years to come. It will be remembered through this building.